The RBA left the cash rate on hold again in February with the cash rate now remaining at 1.50% for two and a half years. Data over the past two months has continued to deteriorate. As a result the RBA has made a substantial shift in their rhetoric and now sees the risks to the outlook as being more “balanced”. 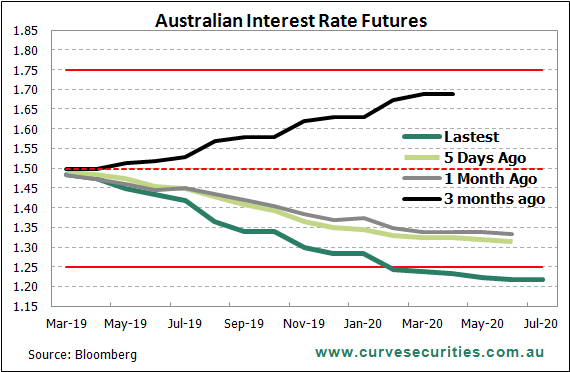 Market pricing suggests the risks are skewed to the downside with a rate cut now fully priced in over the next 18 months. The RBA left the cash rate on hold again in February, marking 30 months the cash rate has remained at 1.50%. According to the latest from the RBA, they now see the risks to the outlook as being more balanced, with the next move in the cash rate just as likely to be up or down. However, the market pricing suggests there is greater downside risks, with long term yields falling sharply again over the past month leaving the curve even flatter. In fact, following the RBA’s “balanced outlook” statement, the chance of a rate cut by the end of 2019 jumped and is now nearly fully priced in. Short term rates have dipped a little over the month as funding pressures appear to have eased slightly as we move further away from the December year end squeeze. There’s also been a shift in the US monetary policy outlook as the Fed puts their rate hike campaign on pause. This pause is largely due to fears of a global slowdown which have caused the FOMC to adopt a “wait-and-see approach”, even in the face of strong domestic data. Throughout the back half of 2018, the RBA repeatedly promoted an optimistic outlook for the Australian economy. Even up until the December meeting, at which point the data in our mind was already undermining such a positive disposition, the RBA still suggested the next move in the cash rate was more likely to be up than down. In the intervening period between the RBA’s December meeting and their latest update last week, the data has largely continued to deteriorate. House price declines have accelerated in both Sydney and Melbourne with the weakness now spreading more broadly across other major cities and regional areas. 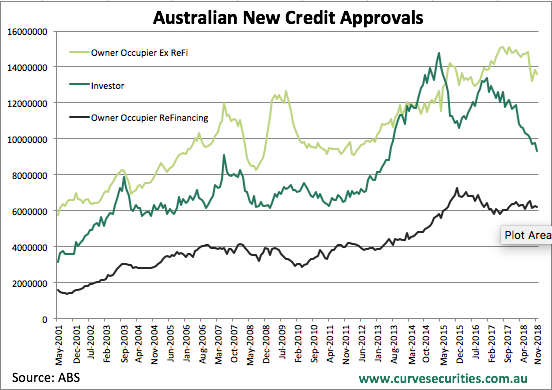 New credit approvals have fallen further and the growth rate in outstanding credit has slowed. Building approvals have capitulated, imports have slumped. 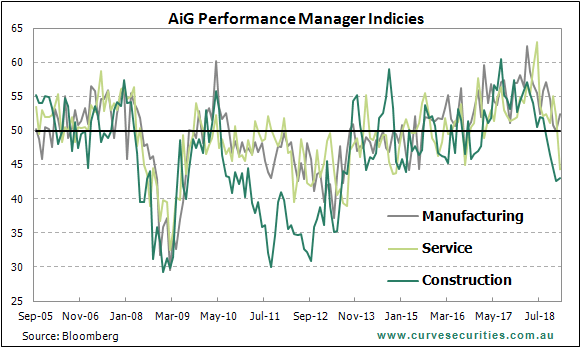 The PMI’s for the manufacturing, construction and services industries have all fallen below 50. Job ads have slowed and the monthly inflation index was negative in January. The pull back in activity has even impacted the monthly business survey which had so often been the bright light for the outlook. 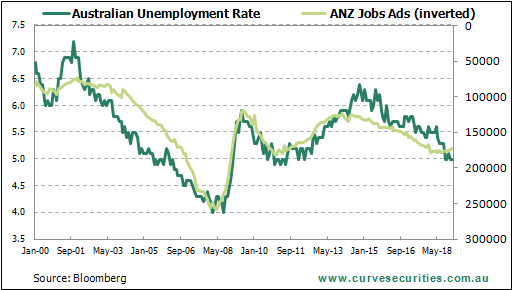 As the statements above suggest, the RBA has made some subtle revisions to both their growth and inflation forecasts but still expects the unemployment rate to fall further over the forecast period. The lack of recognition of the downside risks to the economy in the statement left many scratching their heads given the severity of the deterioration in the data over the past two months. Fortunately the day after their meeting, Governor Lowe provided some much need clarity on what the RBA meant by “some downside risks have increased” when he addressed the national press club (you can see my initial comments in an interview on Your Money straight after it here). Governor Lowe was questioned following his speech on how balanced the risks were, such as 50:50 or 55:45, he confessed that his crystal ball wasn’t that good. With the RBA now acknowledging that the risks to the outlook are now more balanced, it makes the outlook for monetary policy far more complicated. Market pricing, which prior to the meeting was already suggesting the next move in the cash rate would be down, has moved even further following the latest update from the RBA. Prior to the RBA’s meeting on Tuesday, the market was around 50:50 that we would see a cut by the end of 2019 with a 75% chance priced in by mid 2020. Since the RBA’s meeting and subsequent speech from Governor Lowe, the market is now nearly fully pricing in a cut by year end. It is then fully priced in for early 2020 with a growing chance of a follow up one not too far behind. Despite market pricing, the hurdle remains high for the RBA to actually cut the cash rate further from here based on previous comments from Governor Lowe around financial stability risks. So it then becomes a question of what would it take to force the RBA to cut rates. The obvious area of concern, which is also the one where the data has been the weakest, is the housing market. 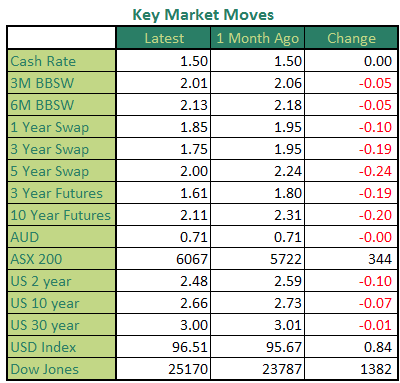 However, the RBA is currently quite comfortable with the developments to date, putting the recent moves in prices and construction activity in context. 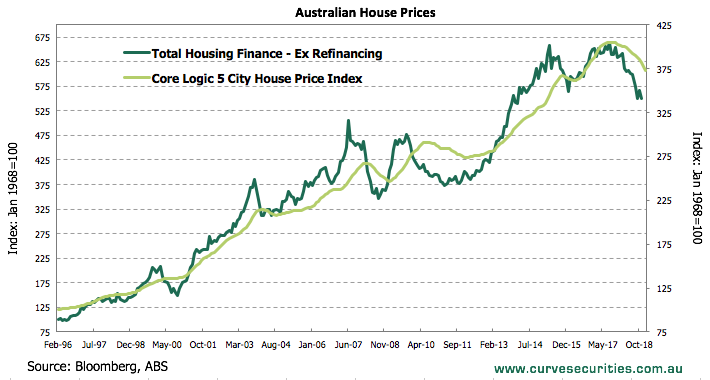 In last Tuesday’s statement, the RBA said that “The housing markets in Sydney and Melbourne are going through a period of adjustment, after an earlier large run-up in prices.” Lowe then added in his speech that “the adjustment in the housing market is manageable for the financial system and the economy.” So the housing market itself, according to the RBA, doesn’t currently represent a potential trigger point for cutting rates. To that end, the data to date on consumption and employment isn’t exactly terrible. While retail sales fell heavily in December, part of that decline was due to the pull forward of sales events in November such as Black Friday and Cyber Monday sales promotions. The employment data has also remained strong and companies reporting difficulty finding suitable labour are growing according to relevant survey’s. Looking ahead though, there are signs that both consumption and employment could come under pressure. 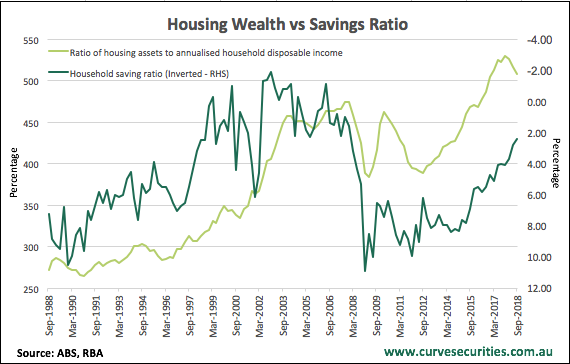 For consumption, the negative wealth effect from falling house prices is usually associated with a rise in the savings rate. With wage growth still weak, this increase in savings would come at the expense of consumption. For the employment market, some key leading indicators are starting to roll over. 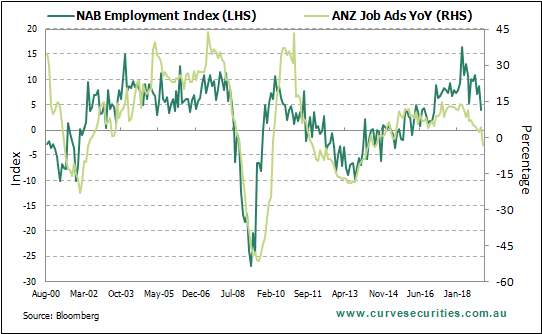 The employment index from the monthly business survey has been trending lower since its cycle high earlier in 2018 while the ANZ job ads report has been in a downtrend for the past 8 months. 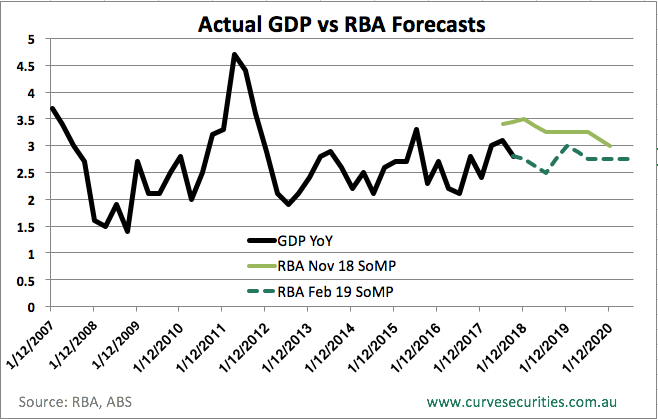 So despite the RBA only going as far as saying that the probabilities appear to be more evenly balanced, the data to date suggest that there is a great probability of a cut than a hike. The question then becomes around timing and whether or not the data will deteriorate enough between now and when the election eventually is called for. Time will tell but the risk of a rate cut is rising and they usually come in pairs. Growth disappointed in the third quarter with the 0.3% increase only half what was expected. The annual rate slipped to 2.8% while the previous quarter’s 3.4% rate was revised down to 3.1%. The RBA downgraded their forecast for growth in 2019 down from 3.5% to 3%. CPI slightly exceeded expectations in Q4 with headline inflation rising 0.5% while core inflation rose 0.4%, in line with expectations. The annual rate of headline inflation inched further below the RBA’s target band to 1.8%, while the core annual rate stayed at 1.75%. The employment data continues to post interesting outcomes. Jobs growth bounced back in December with jobs growth of 21,600. It edged the unemployment rate down 0.1% to 5% as the participation rate dropped slightly. Business confidence edged up from 3 to 4 over January, but still remains below its long run average while business conditions rebounded to 7 after capitulating in December. The employment index remains solid edging up from 4 to 5, staying above long run averages. Consumer confidence declined from December with all sub-indicies falling in January. The headline index was down 4.7% to 99.6, indicating the number of pessimists now outnumber optimists. Retail sales fell 0.4% in December, undershooting expectations. 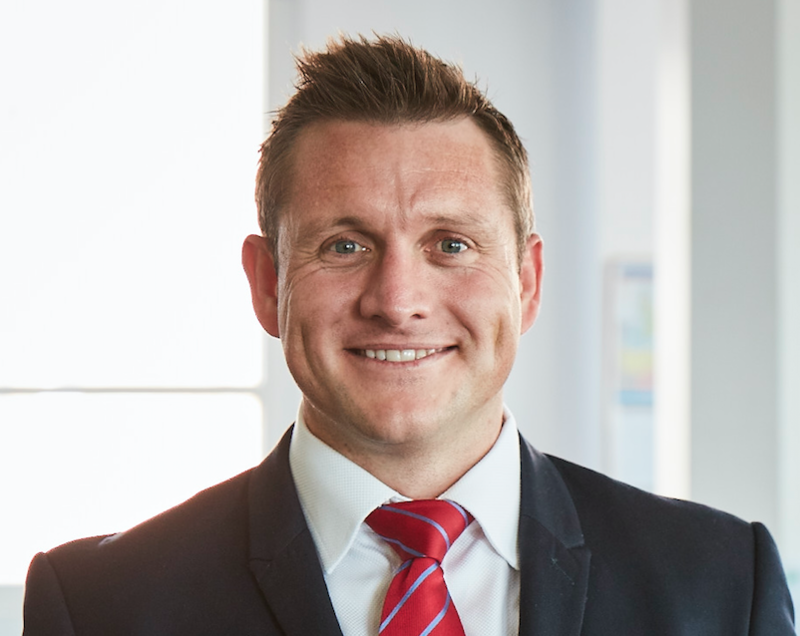 The sharp decline is partly a result of sales being pulled forward in November which saw a 0.4% increase in retail sales. The downward trend in housing finance continued with weak figures in December. The value of lending to households fell 4.4% and the value of lending to businesses dropped sharply by 9.7%. 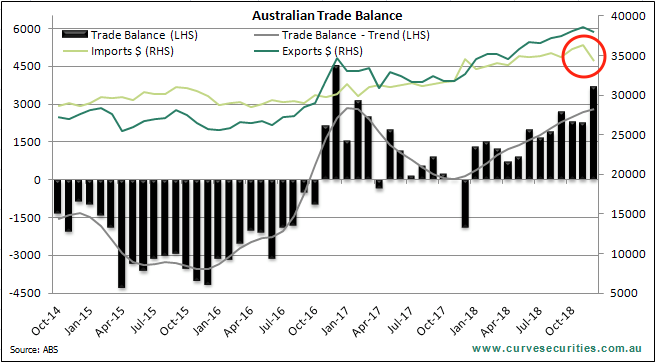 Australia’s trade surplus surged in December to $3.7 bln; however, there may be cause for concern as imports fell 6%, potentially indicating a slowdown in aggregate demand. Net exports are also likely to detract from growth with the increase in exports coming via higher prices rather than increased volumes. Building approvals sharply declined for the second consecutive month with approvals collapsing 8.4% in December. With this figure now down 40% from its’ peak, it is clear the construction sector is quickly cooling down.